Introducing an innovative, inexpensive and easy-to-use technology that dramatically simplifies Magnetic Resonance Imaging. Accusorb MRI® virtually eliminates image wrap-around, ghosting and unwanted artifacts, limiting the need to use the anti-aliasing system software option. Using Accusorb MRI® allows more options. Use a smaller field of view, smaller phase, shorter scan times as well as thinner slices. Patient throughput and comfort are improved. Patient manipulation, software adjustment, & scan analysis time are minimized, all resulting in cost savings. Accusorb MRI® physically restricts the scanner’s field of view (via radio frequency absorption and isolation) keeping unwanted areas outside the established field from wrapping into the image. .
Accusorb MRI® uses advanced flexible RF absorbers and thermal barriers to prevent heating of the blanket so the patient remains safe and comfortable throughout the scan. Accusorb MRI® is reusable and has a product life of three years. We stand behind and warranty our products for the full three years of use. 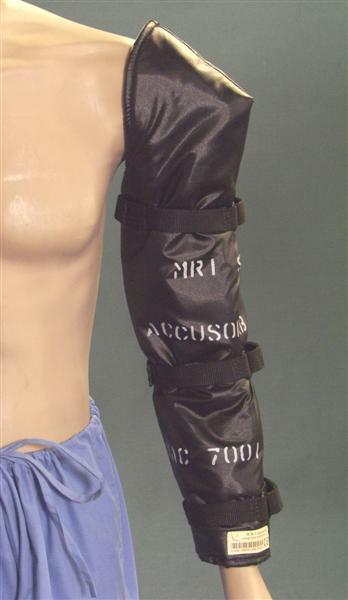 Accusorb MRI® products are available in sizes and shapes designed to cover specific body areas. They can also be custom made to virtually any shape for use in new applications in and around the MRI environment. The Accusorb MRI® story began in 1983 when MWT Materials began as a spin-off from the Georgia Tech Research Institute. MWT developed a range of state of the art radar absorbing materials in the late 1980’s. These products were used for RF (radio frequency) energy management in the wireless telecommunications sector, among others. In 2004, in response to inquiries from the medical industry, MWT developed its first RF absorbing product specifically designed to enhance MRI imaging. Today, Accusorb MRI® is being used in hospitals & imaging centers worldwide. © 2016 by MWT Materials, Inc - All rights reserved.